During the After-School and Summer STEAM programs, students get a chance to explore the opportunities to learn, be engage, and network with professional in the STEAM fields throughout the school out year and during the summer months. 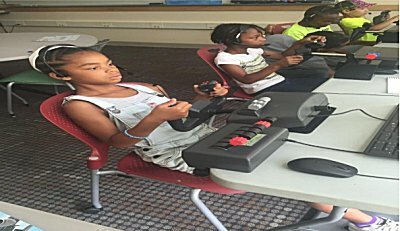 Students are motivated through hands- on activities such as computer building, coding, crime scene investigating, flight simulation, radio control cars racing, robotics competition and cyber security challenges. Donations given here will help prepare our youth for tomorrow.